Living in Wisconsin, you resign yourself to eating from the small stream of local fruit. Apples, sure. Pears? Check. We have berries – strawberries, blueberries, blackberries, and raspberries – but the season is short and they are often expensive and available in limited supply at the farmers market. There’s a few others (and many wild fruits for foraging if you know where and when to look) but let’s face it: we aren’t Michigan. So it was a pleasant surprise to run across bags overflowing with Wisconsin peaches at the farmers market this last weekend. Not only peaches but peaches in October, a month that I tend to associate with the emergence of hardy greens, cabbages, potatoes, beets, and squash. I eagerly bought a sack – and may have elbowed a few people aside in my hurry and delight (sorry, folks) – and rushed back home to dig in. While I often think of peaches reaching their apogee in southern climates, peaches and apples actually have similar life stories. Peaches are believed to have originated in north China, not all that far from the mountains of Kazakhstan that birthed apple trees. They traveled east, west, north, and south with people and animals. The Romans learned about peaches from the Greeks who had learned about them from the Persians who had first introduced them to the West. In conquering Persia, Alexander the Great took many things from the Persians but one of the most valuable was their love and knowledge of fruit, including apples and peaches. The Romans even called them “Persian Apples” for the Persians who loved them and likely “apples” for their round shape (many round fruits and vegetables have been called “apples” at some point, from cherries and avocados to eggplant). 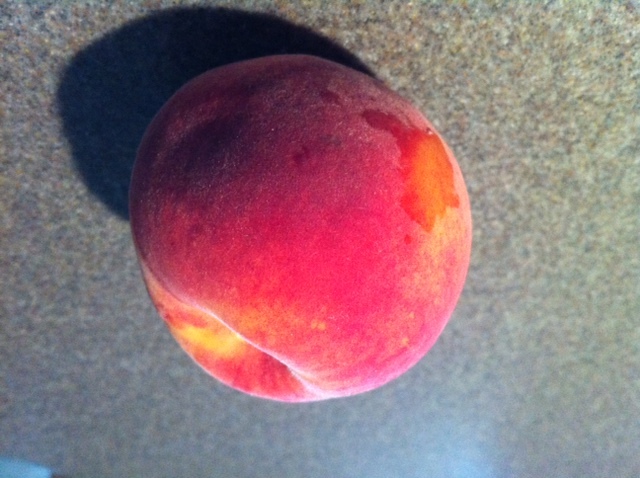 The Spanish fell particularly hard for the peach and brought it to the Americas, where Native Americans are widely credited with spreading peaches across the continents… and even to Wisconsin, I suppose.